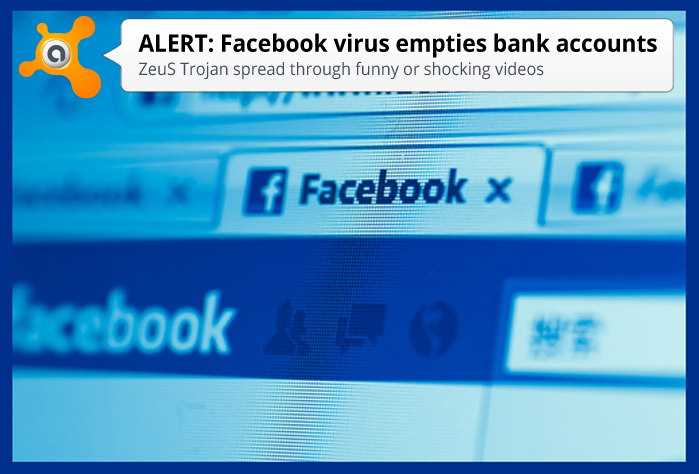 A dangerous Trojan named ZeuS is making its way among Facebook users. This old Trojan horse has infected millions of computers over the years, stealing banking credentials and other personally identifiable information. Zeus can lie dormant on infected computers until the unsuspecting victim logs into their bank's website. Once you’re logged in, cybercrooks can steal your log in credentials and empty your account without your knowledge. The virus is spread through phishing messages either from a funny or shocking video from a friend posted on their page or in a message to you, or through an ad for videos or products. If you click the link to watch the video, a notification will say that you need to update the player. When you click update, you are actually downloading the Trojan. Clicking the Play button automatically gives your "Like" to the virus page, and it’s through this action that the link will spread to all of your friends. All avast! Antivirus products detect and block Zeus if a user tries to install or run the .exe file, but the best way to protect yourself is to avoid it! avast! SafeZone is recommended for safe banking, financial transactions, and shopping online. It gives you a private, secure, and isolated desktop which keeps you safe from keyloggers like the ZeuS Trojan. avast! SafeZone is available in avast! Pro, avast! Internet Security, and avast! Premier.